Slowly but surely I'm building out my gallery here on the site. 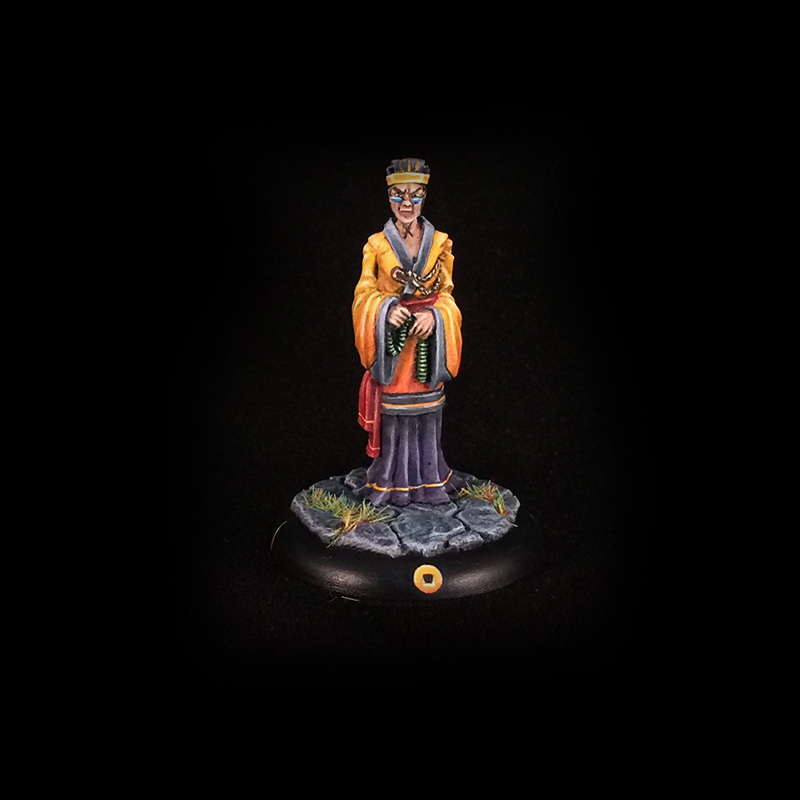 The next two miniatures to join the diminutive parade are Fitiaumua and Old Zo. These complete my full 50 point Silvermoon Syndicate Bushido list. They've yet to take the field as a painted unit, but I'm looking forward to it. First up is Fiti. I've already written a bit about him and the steps I went through painting his tattoos. 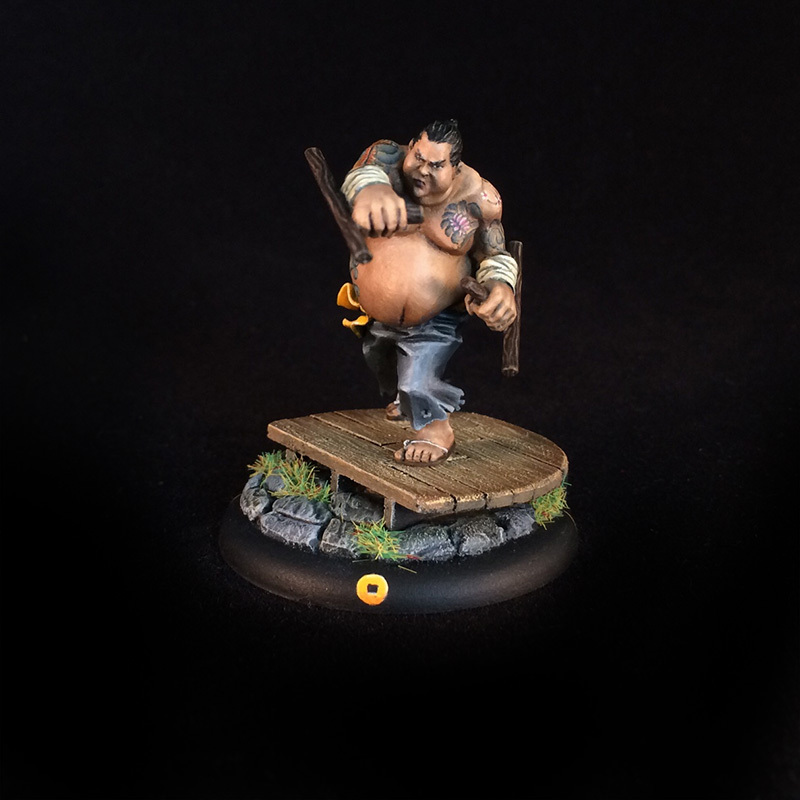 I continued on after the photos in that blog post and painted some more tattoos, including a koi fish on his arm and more flowers on his side and chest. I tried to fill them in with blue waves, similar to a what you see on a lot of traditional irezumi tattoos. For his base, I wanted to give him a bit more height than the rest of the Silvermoon who are standing directly on the cobblestones. Despite being an imposing fellow, he looks a bit small when standing next to Manu. So to give him a bit more elevation I built a small wood platform. I hoped to use the wood texture when painting, but after everything was base coated it was clear that I'd need to paint on the wood grain texture by hand. I'd already done a bit of this on his tonfa/batons, but the floor was a bit bigger. Fortunately, I discovered that painting fake wood grain can be tremendously relaxing! Next up, completing the set is Old Zo. My original decision to go with the Silvermoon Syndicate as my Bushido faction was driven entirely by my desire to paint some unique models. I was looking for something other than muscular warriors or armored samurai and the Silvermoon Buto fit that goal. Old Zo (like Harukichi) is also another non-warrior mini that provided something unique to dig into. After recently finishing Fitiaumua, I decided to go a bit simpler with Zo and avoided going crazy with freehands. While the warriors in my band feature a lot of grey with a yellow highlight, I wanted to try inverting that with Zo and so painted his robe in the orange-yellow, using the grey for the trim instead. Another old Oyabun, he's earned the right to a little luxury in his color palette!